When making decisions at the Statehouse, I always consider the needs of our community first. Several years ago, it was brought to my attention that children from our area and across the state struggle in school due to a learning disability called dyslexia. 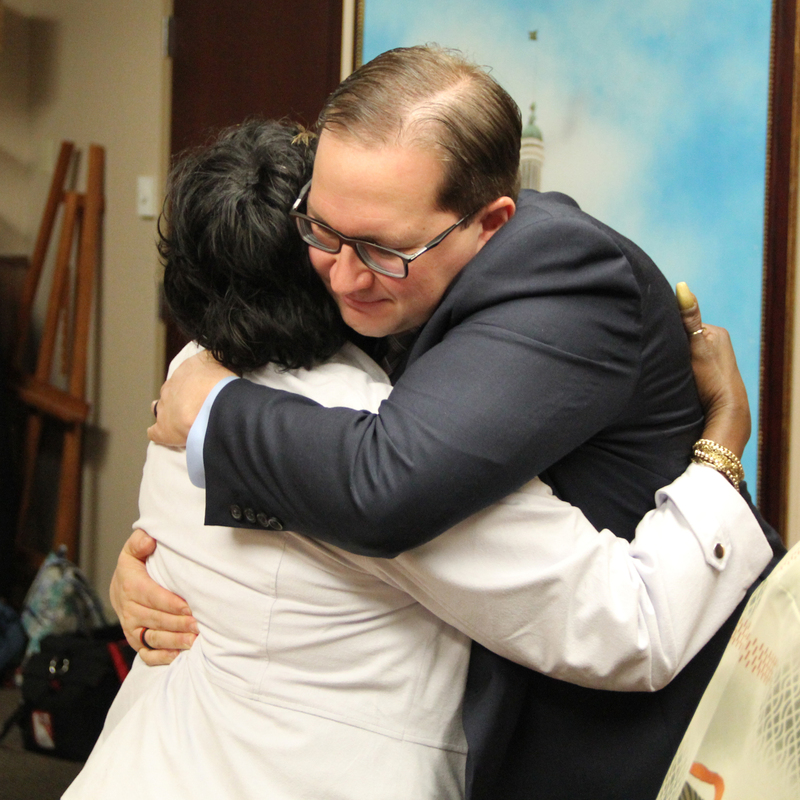 At the time, I was not particularly familiar with the disorder, and conversations I had with fellow Hoosiers led me to pursue legislation to address some of the challenges these students face. 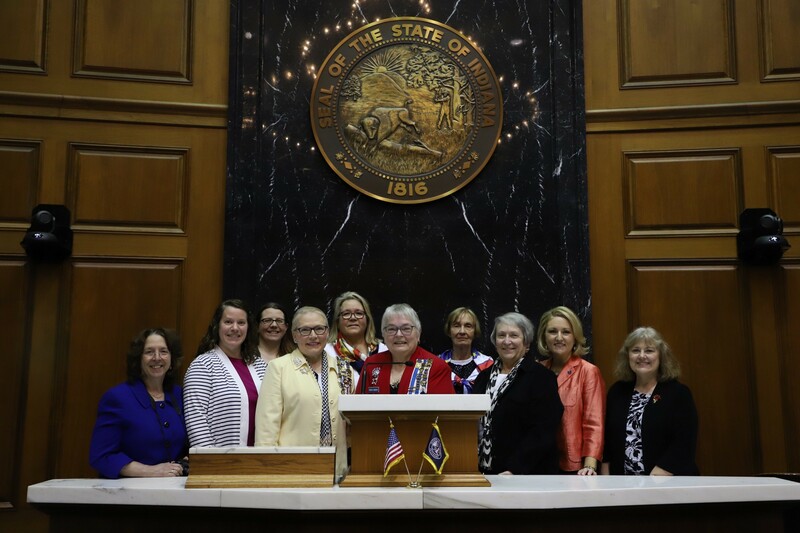 STATEHOUSE (April 11, 2019) – Legislation authored by State Rep. Chuck Goodrich (R-Noblesville) to create a pilot program for local senior citizens to mentor students is moving to the governor for consideration as a new law. STATEHOUSE (April 11, 2019) – The Senate Homeland Security and Transportation Committee recently voted in support of State Rep. Tony Cook’s (R-Cicero) bill that would open lines of communication between schools and law enforcement to better protect students. Currently, law enforcement and school corporations cannot share a student’s alarming behavior, school files or criminal records, even if it pertains to public safety threats. Cook’s proposal would enable school corporations or law enforcement agencies to request certain, pertinent information from each other about a student for the purpose of enhancing safety. STATEHOUSE (April 11, 2019) – After receiving unanimous support in the House and Senate, State Rep. Cindy Ziemke’s (R-Batesville) legislation allowing more qualified health professionals to work without burdensome oversight could soon become law. STATEHOUSE (April 10, 2019) – After Tuesday’s unanimous approval by the Indiana Senate, State Rep. Cindy Kirchhofer’s (R-Beech Grove) legislation aiming to lower Indiana’s infant mortality rate could soon be signed into law. 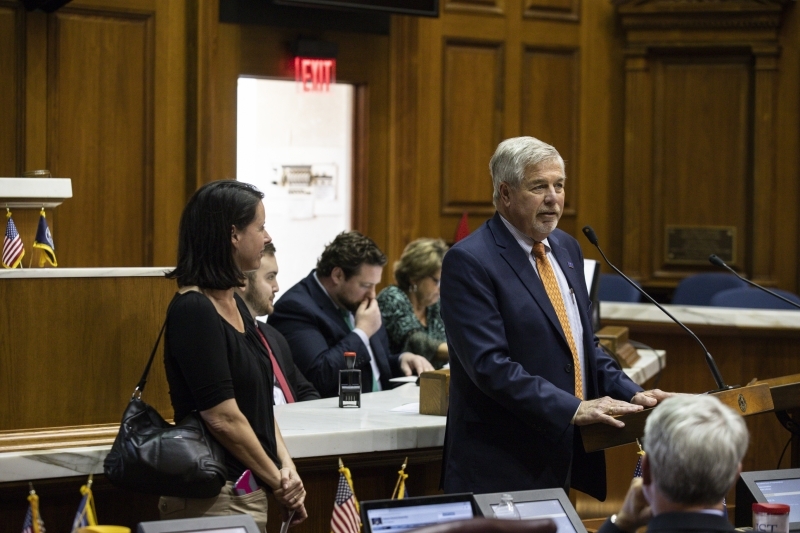 STATEHOUSE (April 10, 2019) – State Rep. Bob Behning’s (R-Indianapolis) legislation that would provide educators additional opportunities to earn more while remaining in the classroom could soon become law after Tuesday’s unanimous vote in the Indiana Senate. 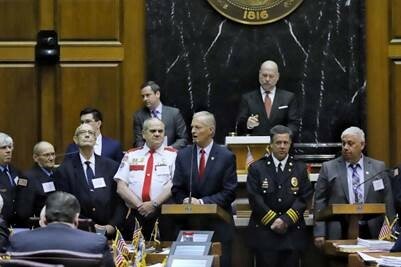 STATEHOUSE (April 10, 2019) — State Rep. Bob Cherry (R-Greenfield) at the Statehouse recently honored Indiana State Trooper Roy Edmond Jones who was killed in a crash when responding to a call while on duty July 3, 1979, near U.S. 36 in Pendleton. STATEHOUSE (April 10, 2019) — State Rep. Kevin Mahan (R-Hartford City) at the Statehouse honored Marion native Pearl Bassett for her work as a civil rights activist throughout the majority of her nearly 108 years of life. STATEHOUSE (April 10, 2019) – Legislation authored by State Rep. Martin Carbaugh (R-Fort Wayne) creating a new civil penalty for occupational safety and health violations recently was supported by the Indiana Senate and could soon become law. STATEHOUSE (April 9, 2019) – With support from the Indiana Senate and the House of Representatives, State Rep. Woody Burton’s (R-Whiteland) legislation that would make the U.S. citizenship test a part of high school government classes could soon become law. 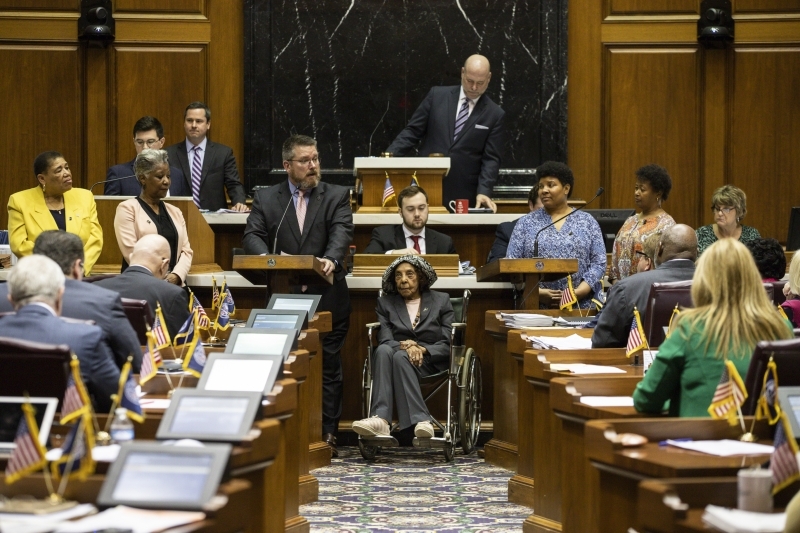 STATEHOUSE (April 9, 2019) – A DeKalb High School graduate is gaining experience as an intern with State Rep. Ben Smaltz (R-Auburn) and his fellow members of the Indiana House of Representatives during the 2019 legislative session. STATEHOUSE (April 10, 2019) – State Reps. Heath VanNatter (R-Kokomo) and Mike Karickhoff (R-Kokomo) honored the Northwestern High School girls basketball team Tuesday at the Statehouse for winning the Indiana High School Athletic Association Class 3A state championship. 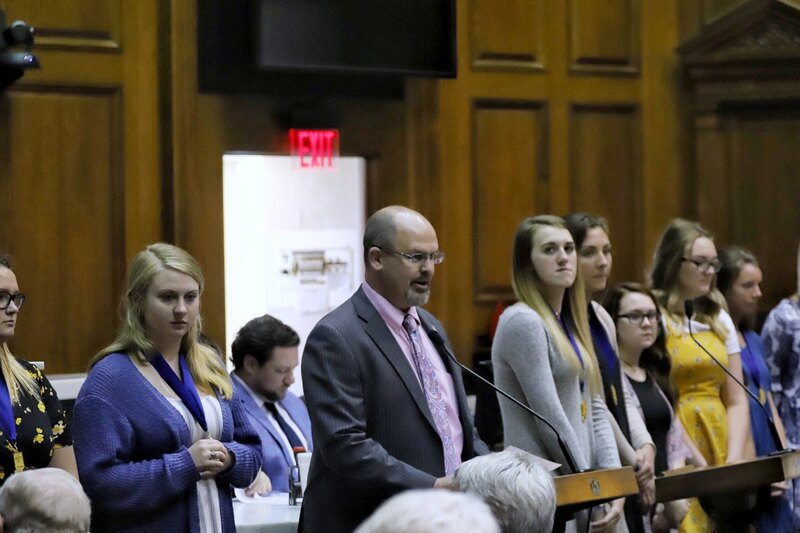 CAPTION: State Rep. John Young (R-Franklin) (right) honors members of the Franklin Community High School show choirs with a resolution for their achievements Thursday, April 4, 2019, at the Statehouse. Several of the choirs, all led by Head Choir and Musical Theater Director Michael Hummel (third from the right), have earned championship titles over the last few years. The students showcased their talents with a performance in the House Chamber. 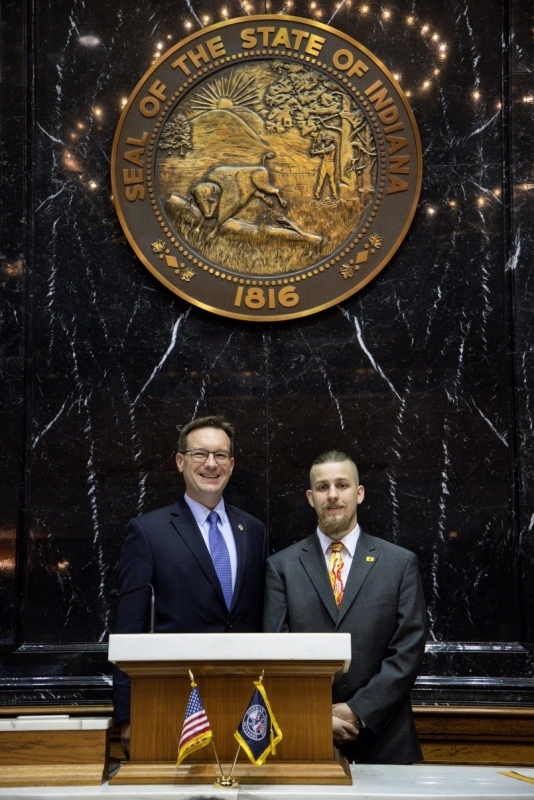 STATEHOUSE (April 8, 2019) — A Columbus East High School graduate is gaining experience as an intern with State Rep. Ryan Lauer (R-Columbus) and his fellow members of the House of Representatives during the 2019 legislative session. The first law enacted by the Indiana General Assembly this session will help save the lives of Hoosier babies. I co-sponsored Senate Enrolled Act 41 to expand the scope of newborn screenings in order to identify more diseases and conditions, so that babies have a better chance of survival.